The report (read it here) found that 20th Century Fox and CBS were the leaders in hiring and auditioning actors with disabilities. 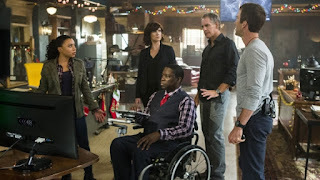 It found that CBS leads in employment with 11 series and pilots having hired performers with disabilities across the network, while 61% of Fox’s dramas (14 out of 23) and 69% of its comedies (nine of 13) auditioned performers with disabilities for the past and current TV seasons. “So many times when producers or casting directors hear the word ‘disability’ they think ‘inability,’ and we need to change this preconception,” said Daryl “Chill” Mitchell, co-author of the report and a regular on NCIS: New Orleans (pictured), one of the few primetime series performers with a disability. “What we want is the chance to audition. I wouldn’t have my job if I wasn’t the right fit.” Mitchell has been paralyzed from the waist down since a motorcycle accident in 2001. ABC had five shows that hired disabled performers during the past year, NBC had three, and Fox had one. On cable, HBO had three shows that hired disabled actors; Showtime and FX had two; and AMC, TBS, Cinemax, Comedy Central, Disney XD, Freeform, Nickelodeon, Pop, Starz, Syfy and TBS each had one. Among the streaming services, Hulu had three shows that hired disabled actors; Netflix and Amazon each had two. Networks whose shows didn’t hire any disabled performers – at least, as the report notes, “none with open disabilities, and definitely not visible ones” – include the CW, Disney Channel, Bravo, History, TNT, Spike, TV Land, USA Drama, CMT, Audience Network, VH1, Crackle, Epix and CBS Internet. “While we acknowledge that blackface has a deeply racialized history and origin driven by blatant racism, the argument we made in last year’s White Paper maintains that there are some nuanced parallels when it comes to the effect of blackface, as compared to the effect of disabled mimicry: 1) the erasure of a group of people, and 2) public acceptance of that erasure. The authors of the report insists that they are “not absolutists” when it comes to the representation of disabled characters and the actors who play them. “We often have arguments levied our way claiming that not every single character with a disability could possibly be played by an actor with a disability. Some argue that there are certain types of disabilities just too rare to find actors for. To these claims we say: we are not absolutists. Our claim is not that every character with a disability must be portrayed by an actor with a disability. Instead, we advocate for more equity and frequency for performers with disabilities to be considered for any role, whether or not the script indicates disability.